Daniel Cuervo is back with isTia. Yes, this is the second time I interview him. But this time, his amateur days are over: he just got sponsored by a bunch of brands and is now officially a pro. But things have not changed for him. God is still in control and Daniel merely follows His guidance. In the Bible, God has many names and helps in many different ways. The key is that you never know how He will help you. Then later she was also there when Daniel: ”wanted to come to USA to train. 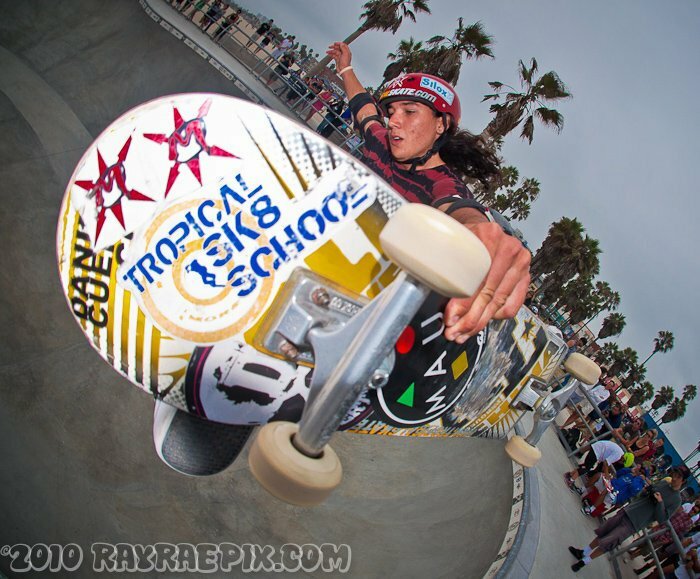 Tropical skate contacted me and I already knew he was a good kid and skater.” That was in last January. Since then she just told me a couple of days ago that she is already working on Daniel’s visa for a third stay in the US, this time, for a full year. The other benefactors that God put on Daniel’s path are Giuseppe Polanco, Ivan Marono, the Pastor Christian Hosoi, Jay Haizslip and Tony Hawk. Actually, Daniel and Tony have a lot to share. Not only their styles are very similar, but they almost share the same last name. A “Cuervo” in English is a “Crow”. isTia: When did you arrive from Republican Dominic? isTia: Where did you stay? Daniel Cuervo: As usual, at the home of Heidi Lemmon, SPAUSA. isTia: Did you stay with her all the time or did you go to live somewhere else? isTia: How long did you think you would stay here? Daniel Cuervo: Actually I thought I would stay only two months; until the first days of September, but then I felt I should stay longer. I think God has the calendar of our lives and our plans. God leads the way, sometimes we will stay put, even if we make plans. I felt that God had several things to give me before I leave and that was it. I changed my plane ticket to the October 6 and it was all a blessing because I was sponsored by Maui and Sons and got to go to the Tim Brauch Memorial Bowl Contest and got 8th place in my first professional bowl contest. isTia: So, you changed your plans to stay longer? Daniel Cuervo: No. I never changed my plans because I never wanted to. God is the one that changed my plans, I felt something was missing. I felt I could not return home without this happening. God takes control of all. ﻿isTia: We did your first interview for isTia 10 months ago in February, then you went back to Dominican Republic. Why did you come back to California a second time? To train or was there anything else you wanted to do at high-level competition? Daniel Cuervo: I came here for training purpose. The competition at San Jose was a total surprise. isTia: What was your goal when you arrived in Southern California? Daniel Cuervo: I came here to represent my country, to let people know that skateboarding is a shared activity in Dominican Republic and to put the Dominican Republic in the skateboarding world map. isTia: Have you achieved your goal? Daniel Cuervo: No, there is still a long way to go. I am just at the beginning of the goal that I want to achieve. isTia: Which church did you attend while you were here? isTia: How did you meet Jay Haizslip? isTia: Where did you skate? Only Venice, Culver City or did you go to another park? isTia: Did you skate in a backyard pool? isTia: Did you go to another state? isTia: With who do you skate? isTia: You have a lot of pictures on your Facebook page, who took them? Daniel Cuervo: I love the pictures of Ray Rae, Matt Fisher, Michael Chantry and Julian Bleecker… They have all taken pictures of me. isTia: There's a picture of you on Facebook that Ray Rae took, where you are doing a big aerial. On the front of your board, we can see a sticker of Tropical Skate School. In this Facebook pictures Steve Primo, MOFO, Block, Adam Paul, Bobby Rae said very nice things about you... How do you feel when all these legends take the time to congratulate you publicly? their family is more a pride than a dream. isTia: Who are your sponsors? Daniel Cuervo: My sponsors are: Tropical Skate School, SAPUSA, Maui and Sons, XCaliber, Jymmy Z.
isTia: How did you find your sponsors? 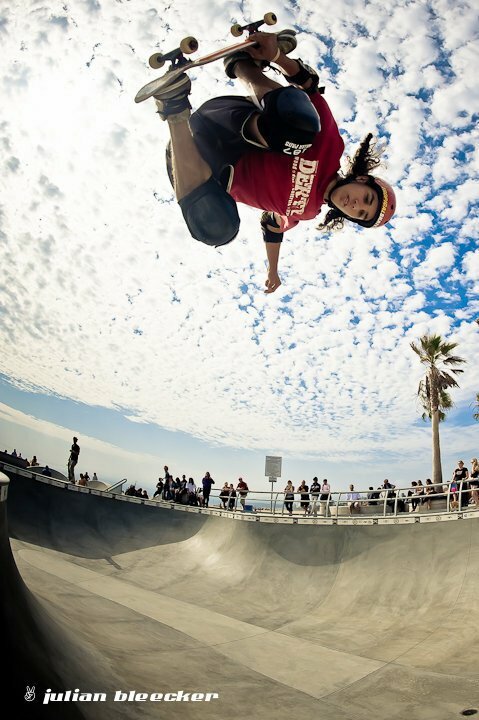 Daniel Cuervo: I was at Venice skatepark, and I was riding in front of the Maui shop every day I was in California. Then, from the store they saw me fly gain and again, every day, and then they came and I was with the Maui family. isTia: What does it mean for you to be PRO? Daniel Cuervo: It means to love skateboarding and to know that, not only I have a skateboard under my feet but that I have a tool with which I will be the image, the representation and the figure of many young people who want to be like me. I want to be a positive example as a person before being an athlete, before being a pro. Being PRO is not just a title, it is a lifestyle that one is broadcasting when you want to stand out from the others. Being a PRO shows that every sacrifice and pain has a eventually a reward. Being PRO is not only having the guts to compete and win, it is also being able to accept the moments of defeat and victory. Conclusion: IN TO MY BEING PRO THE RESULT OF A LOT OF EFFORT AND DEDICATION. isTia: Is your life going to change now? Daniel Cuervo: Now, I'll be competing in the World Cup skateboarding, and traveling, probably a lot. isTia: Are you really first pro skater of the Dominican Republic? Daniel Cuervo: I am the first pro skater of the Dominican Republic.... I am very thankful to God for putting me where I am now ... I give all my regards and thanks to Him, who put all those people in front of me and that’s because of them that I am where I am .... My mom, Heidi Lemon, Giuseppe Polanco, Ivan Marono ... I looooove them all. isTia: Has it been difficult to find a sponsor? Daniel Cuervo: Yes, I thank God for the way because it is difficult. Because of that hardship I can appreciate that. isTia: What are they asking you to do? Daniel Cuervo: The first thing they ask me is that I have a good time. isTia: What have you learned during the 4 months you stayed here? Daniel Cuervo by Ray Rae: "Finally, you're starting to get close enuff. - MoFo"
Daniel Cuervo: Many new tricks, learning to live with more skaters in the same room at the Camp Woodward. isTia: What are the new tricks you do? isTia: What are you preferred tricks? Daniel Cuervo: All, if I practice everyday and if I do all my tricks one after another, then they can be dominated forever. isTia: What are the tricks you want to do but still cannot? isTia: Who are your favorite skaters? isTia: How did you do to get into Tim Brauch? Daniel Cuervo: Spausa contacted the world cup, I was referred to them by Spausa. isTia: How did you feel when it was confirmed that you were going to compete in San Jose? Daniel Cuervo: Very excited and grateful to God, I could not imagine competing in a competition of this level this year. isTia: When did you know? isTia: How did you go there? isTia: How long did you stay in San Jose? isTia: Is Tim Brauch your first major competition in the U.S.? Daniel Cuervo: Yes, in the USA. I also participated in Gromfest 2007 and 2008, both in Vancouver Canada. Istia: How were you treated? Daniel Cuervo: That was super cool, like a real family, the pros, photographers, and the public .... I realized that racing is more than sharing with your family. Istia: Did you go for a training sesh in San Jose before the competition? Daniel Cuervo: I arrived a day before the competition, practiced the previous day full from morning till night. isTia: Did people know you beforehand? Daniel Cuervo: Indeed, I appeared as a surprise! I had never before competed in the World Cup competitions. Never before had they seen anyone from the Dominican Republic in an event like this and it was a big surprise for them. isTia: Who was your most difficult contestant at Tim Brauch? Daniel Cuervo: All, all the competitors executed very good tricks. isTia: Some were doing tricks that you did not know? Daniel Cuervo: Yes, I saw tricks that I had never seen before, I was very surprised by the level. isTia: What kind of support do you have from your friends back in Dominican Republic? isTia: Who is your #1 fan? isTia: Do you have the support from your family? Mexican mushrooms..." Ph. Ray Rae. isTia: Which park do you prefer: Venice or Lake Cunningham? 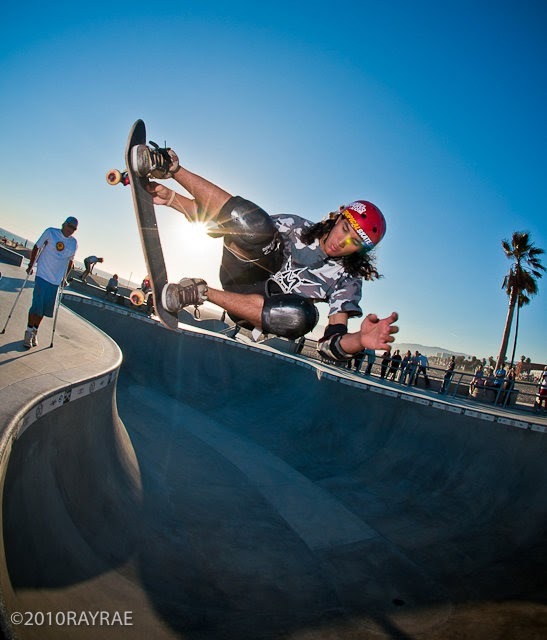 Daniel Cuervo: Venice Skatepark, it was there where I learned to run a bowl. isTia: What is the next competition going to do? isTia: What did you miss here in the States? Daniel Cuervo: Thank GOD I did not miss anything ... All my time here was nice. isTia: What are your personal plans for the immediate future? isTia: What are your personal plans for the long term future? Daniel Cuervo: Follow love and pride representing my country, so other Dominican skaters can go through the door that I am going through and can also get into professional skateboarding. I want to win some money to help my family and give them a better quality of life. isTia: When are you gonna come back? ﻿Translated from Spanish to English by Xavier Lannes. Venice people will miss you while you are on the road next year. Thanks to Ray Rae and Julian Bleeker for the amazing pictures. All pictures copyrighted, used by permission only. Daniel is an amazing young man. Sky and I first met him in Canada at Gromfest 07. He has remained our friend since. I am grateful for his learning English.. though he and Sky never seemed to let language get in the way of skating and having fun. I am proud of him and so happy to have gotten to be there for his first pro event!!!! Congrats and looking forward to seeing you in the near future.